We’ve got a simple, new party idea for the upcoming Kentucky Derby. 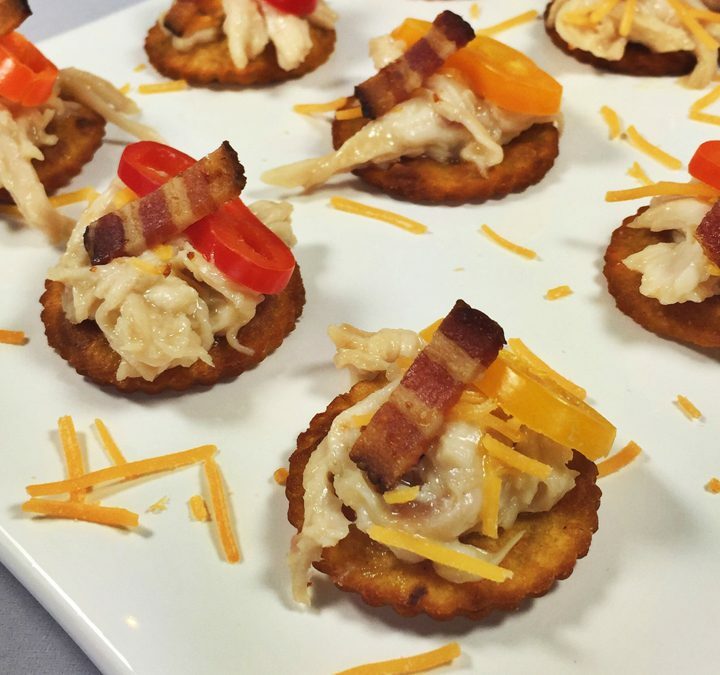 “Wow” your crowd with our Bourbon Chicken Crisps. Easy to put together, our crisps are sweet, salty and flavored with a touch of bourbon. To speed things up, make the crispy base and chicken the night before, then just assemble on the big day. Preheat the oven to 350 degrees. Using a 1 ¾ “ round cookie cutter, cut 24 round bread pieces from the thin slices. On a baking sheet, place a piece of parchment paper. Brush both sides of the bread with olive oil and lightly salt. Place in one layer on the parchment paper and then in the oven. Bake 5 minutes, turn over, and bake 5 minutes more or until brown and toasted. Whisk together the buttermilk, mustard, salt and pepper, and cayenne in a bowl. Pour into a plastic zip-top bag and add the chicken. Make sure the chicken is coated with the marinade, then remove excess air and seal. Marinate in the refrigerator for at least 2 hours minimum or overnight. Preheat the oven to 375 degrees. Remove the chicken from the marinade, rinse and pat dry. Place in a baking dish, cover with foil and bake for 45 minutes or until the breast reaches 165 degrees in the center. Cool slightly, then remove the skin and bone, discard. Shred the chicken and set aside. Note: You can also seal the chicken breast in a vacuum bag, and cook sous vide using an immersion circulator set at 165 degrees for two hours. You can prepare the shredded chicken the night before or use 1 ½ cups of store purchased shredded chicken breast. Melt butter in small saucepan over medium heat. Whisk in remaining ingredients. Simmer for eight minutes while often whisking until thickened. Add 1 ½ cups of shredded chicken and mix thoroughly to combine. Place 1 tablespoon of bourbon chicken on the crispy bread. Top with bacon, a pinch of finely shredded cheddar, and a mini pepper ring.